Stanley F. Barshay is chairman, Consumer HealthCare, for Schering-Plough Corporation, a global science-based health care company with leading prescription, consumer and animal health products. Mr. Barshay holds a B.S. degree in business administration from Long Island University. He also attended New York University Graduate School of Business. He has an extensive background in health care and related consumer products with American Home Products Corporation (now Wyeth). In 1987 he was promoted to senior vice president overseeing that company's consumer businesses and also served on its finance and operations committees. During his career with American Home Products, Mr. Barshay was president of several subsidiaries, including Boyle-Midway Household Products Corporation and Whitehall Laboratories. 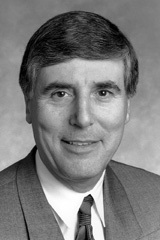 Mr. Barshay retired from Wyeth in 1997 but remained active in the health care arena, joining Schering-Plough in 2003. Mr. Barshay serves on the Board of Trustees of Long Island University, Glen Oaks Club and the Jewish Child Care Association of New York. He serves on the Council of Overseers for the Arnold & Marie Schwartz College of Pharmacy and Health Sciences and serves on the Board of Directors of Bed, Bath & Beyond, Inc.